When Nevermind was first released I was only two years old. My main interests were eating, sleeping, screaming and making a mess. I doubt either of my parents understood grunge let alone played it to me whilst I sat in my high chair. When Kurt Cobain passed away in 1994 I was in my first year of primary school. Although my interests had matured into activities such as drawing, singing (nursery rhymes - not a rendition of Heart Shaped Box) and grazing my knees in the playground I still had no clue who Nirvana were. The innocent eight-year-old me pointed to a long-haired gentleman wearing a t-shirt displaying the now infamous Nirvana smiley face and asked my mother what the logo meant. My mother’s face was enough of an answer; my hand was gripped tightly and my brother and I were swiftly marched off. One of the first things he played to me were the opening four chords of Smells Like Teen Spirit. I made him play it again and again and again. I had heard the song before but had literally no clue who had written it or indeed its cultural significance. I don’t know why those crunching notes affected me so much but I was hooked. Every time I climbed into the car after that day I demanded that Nevermind was put into the CD player and skipped to that song. 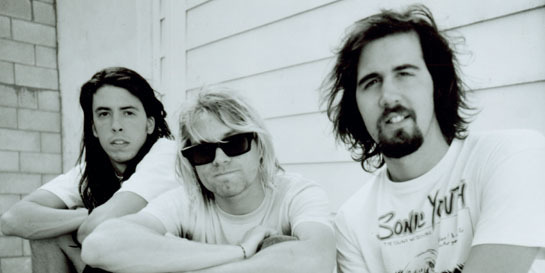 Kurt’s growled vocals, Kris’s booming basslines and Dave’s manic drumming turned me on to rock music, which soon became an interest in all music. Nirvana immersed me in all things audio and to this day I’m still tumbling down the rabbit hole.